This is something a little different – not pseudo or “BS” history, not mythology, and certainly not paranormality. I’m writing this time about debunking – debunking that I, for once, feel goes too far and may be too deep a delve into the politics of nationhood. After 30-something years, historian Hugh Trevor-Roper has (posthumously) released a book entitled “The Invention of Scotland: Myth and History. The section on the kilt is published as an extract by The Times here. 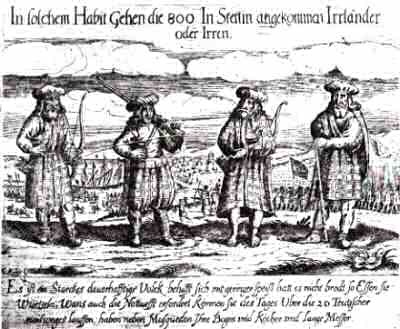 Highland dress in the 1630s. Look like a kilt to you? Sizable chunks of this book have been in the public domain for some time, however, and the piece on the Times website is little different to a chapter entitled The Highland Tradition of Scotland in the 1992 book “The Invention of Tradition”. As I have read only this article, and the extracts and reviews of the “new” book online, I will comment here only on Trevor-Roper’s assault on the kilt. That older book chapter is already referenced (and rightly so) in various spots online, and in that myth-strewn internet environment is a much-needed reality check, as no doubt will be the full tome. You only have to walk down Edinburgh’s Royal Mile to experience the wider world of tartan tat and outright pseudohistory that’s sold in modern Scotland, beholden as it (and the rest of the UK) is to the tourist industry. But, I’m afraid when I see Scots referred to as “the Scotch”, or “Scotchmen” out of quotation marks, I assume an agenda. The epithet appears not only in the original chapter, but in the online article trailing the new book. The author must have been aware that is in a cultural sense, at best archaic, and at worst xenophobic. Let me state that I have no problem with Trevor-Roper’s facts. They can indeed be used to support an argument of cultural invention. But I would argue that they just as easily back a more moderate interpretation. In light of the below, I hope, “re-invention” would seem a more accurate word to use. The accusation levelled at the early Scots of obliterating their cultural antecedents and rivals and bigging up their own achievement, could be made of virtually any people, especially the English. Historical accuracy was not highly prized at that time, and the history of a nation was usually a traditional (i.e. invented) one, with snippets of reality amongst grand poetry, art, chronicles, and so on. Look at King Arthur. Robin Hood. It didn’t matter what was true, what had evidence. Now, of course, it does, and it’s great to explore the myth and reality of history. But to imply that this is a Scottish phenomenon seems unfair, as does the direct comparison with England – by far the bigger country in terms of population, military strength, and political power. History is written by the winners, remember? Perhaps it’s out of context without reference to modern claims, but much of the argument appears as a strawman for Trevor-Roper to set up and then knock down. Why does he even search for medieval origins of the highland dress as it appears in its current form? It would be remarkable if a piece of clothing had remained unchanged in design over a millennium. What English, Welsh, Irish or any other nationally identifying garments have histories anywhere near that long? None. Because fashions change – sometimes gradually, sometimes in bounds. I would suggest the latter is what occurred with the kilt. Trevor-Roper describes two distinct pieces of clothing to make his point that the kilt was “invented by an Englishman”. He states that there was no evolution, just invention, implying that the kilt lacks historical basis, continuity, and even validity as a national dress for highlanders, let alone Scotsmen at large. For me, this argument falls apart as soon as he points out that the “quelt” described by an English officer as “the common habit of the ordinary highlands” was actually one way of wearing what was a much older garment – the belted plaid. The plaid, if not the “quelt” mode of wear, he places well back into the 16th century on hard evidence. Available evidence suggests a belted form of plaid by around 1600. Then, in his article and presumably his new book, he describes the modern “kilt” as having been invented from scratch in the early 18th century. Gleefully invoking the hugely apt “True Scotsman” fallacy, he informs us that it was an Englishman that did so! As if that makes the garment itself any less culturally Scottish. And yet, in his own quote from the inventor, he shows that this was done to the existing belted plaid, in order to “abridge the dress and make it handy and convenient for his workmen”. If this was a wholesale invention, there wouldn’t be a dress to abridge! Another argument used is that the plaid was the dress of the “common soldier, or peasant”. So what, you might well ask? This assumes that the only valid tradition is that of the upper classes, which is totally counter to the (post)modern historical approach, and ignores the majority of the population. The phenomenon of the rehabilitation of the highland dress and its adoption by the upper classes is a fascinating addition to Scottish history, not an indictment of it. The writer is quite right that lowland Scots and other Britons were prejudiced against the strange highlanders, attributing crime and laziness to them due to their very different cultural perspective and economic set-up. This shows that neither the plaid nor the true kilt were, prior to the 19th century, garments worn outside the highlands, but again, it does not detract from the fact that highlanders themselves had been wearing a version of this dress for at least 200 years by the time it was banned by the British government. Far from being “ironical” that the kilt as we know it came about due to a late banning of its predecessor, this is actually more evidence that the “kilt” of 1745 was seen then as being just a permutation of the belted plaid, and most certainly part of the “highland dress”. Trevor-Roper seems to go to extraordinary lengths to separate the two things. The thrust of Trevor-Roper’s argument seems to me to be a sort of reverse argument from antiquity, wherein a piece of culture is only worthy if it’s subjectively ancient. Now, to be fair, this is a reaction to frequent usage of this fallacy – that aspects of Scottish heritage are ancient, and are therefore valid. But two wrongs don’t make a right. The fair thing to do would be to debunk, and then to reassure the reader that there’s really no need to make exaggerated claims for one’s nation. Instead the effect of reading Trevor-Roper is that of deflation – the older highland culture was an inferior copy of Irish culture, and the latter version was wholesale and worthless invention. And again I suggest the poltical agenda behind this shows itself. This is rallying call to unionists who feel that the only worthwhile Scottish culture is that developed under Union and Empire, the flirtation with “highland” culture just a silly diversion. Perhaps’ I’ve missed the point. In case I haven’t though, I’d stress that It’s important to be realistic in setting out to debunk the myths of history. Education as to the true origins of a thing is fantastic, but we must recognise that the cat, as it were, is out of the bag. Academics increasingly do not own culture, high or low. Kilts in whatever form are a long-established part of modern and future Scottish identity, for better or worse – they’re at least 200 years old even in their present form. Older than just about any “national dress” you care to think of. And if people think they’re more ancient, that’s at least in part because they don’t see or care for the difference between one strip of tartan fabric worn like a skirt, and another. If they think they’re really old, they might have read Scott, but more likely, they’ve probably just seen Braveheart once too often. That can be remedied without ridiculing and belittling their culture, and their ignorance certainly doesn’t make their clothing any less of an identifier for being Scottish. Is a London executive who doesn’t know the history of the three-piece suit any less a businessman?